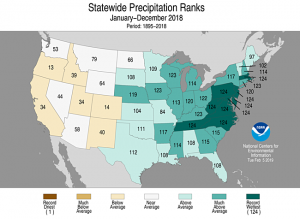 February 6, 2019 – For 2018, the nationally averaged precipitation for the contiguous U.S. was 34.63 inches, based on preliminary analysis. This total was 4.69 inches above average, the wettest in the past 35 years, and third wettest since the modern record began in 1895. The total was largely driven by record and near-record annual precipitation across much of the eastern United States. The average annual temperature for the contiguous U.S. was 53.5°F, 1.5°F above the 20th century average. This was the 14th warmest year on record and made 2018 the 22nd consecutive warmer-than-average year for the U.S. (1997 through 2018). 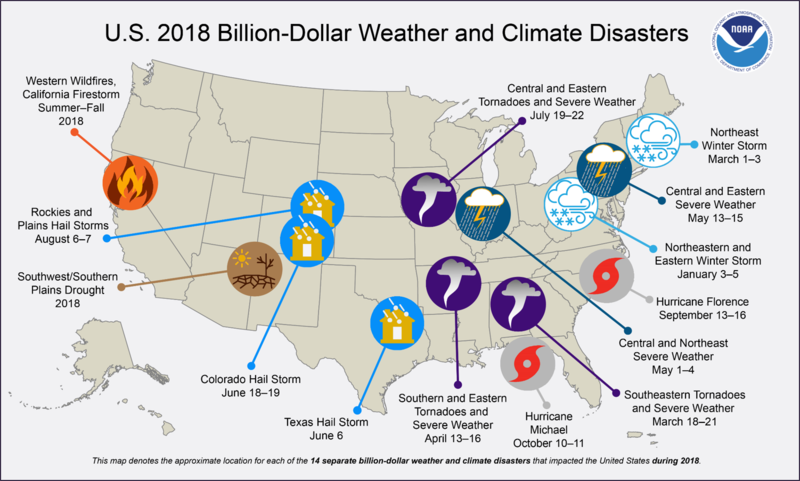 During the year, 14 weather and climate disasters each exceeded $1 billion in the United States. There were 247 known fatalities associated with these events, and their total costs were estimated to be about $91 billion. Both the number of events and their cumulative cost ranked fourth highest since records began in 1980. Three events each exceeded $20 billion in damages: Hurricanes Florence and Michael caused $24 billion and $25 billion in damages in September and October, respectively, and a combination of western wildfires in summer and fall caused $24 billion in losses. This was the second consecutive year in which a new record was set for national losses due to western wildfires. 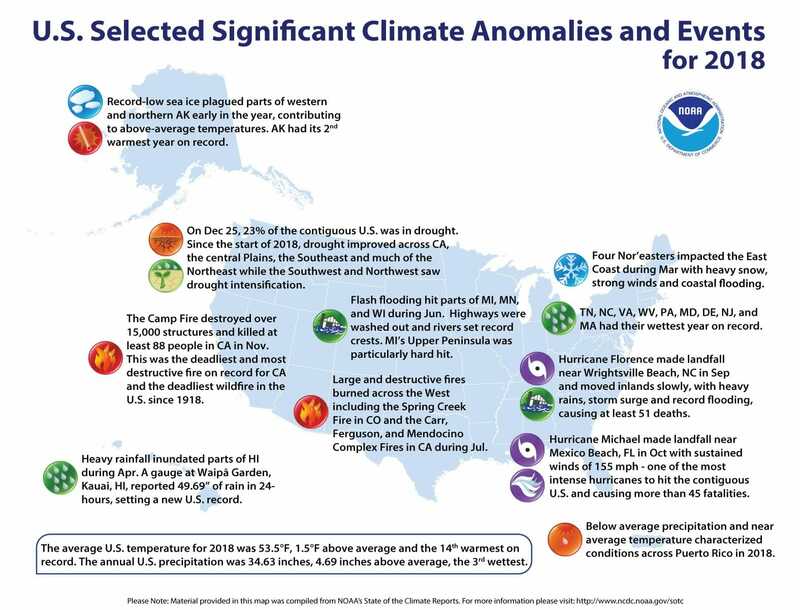 This annual summary from NOAA National Centers for Environmental Information is part of the suite of climate services NOAA provides to government, business, academia and the public to support informed decision-making. This was the sixth consecutive year with a nationally averaged precipitation total greater than the 20th century average. Since 1895, total annual precipitation across the contiguous U.S. has increased at an average rate of 1.81 inches per century. Much-above-average to record-high precipitation fell across much of the contiguous U.S. east of the Rockies. 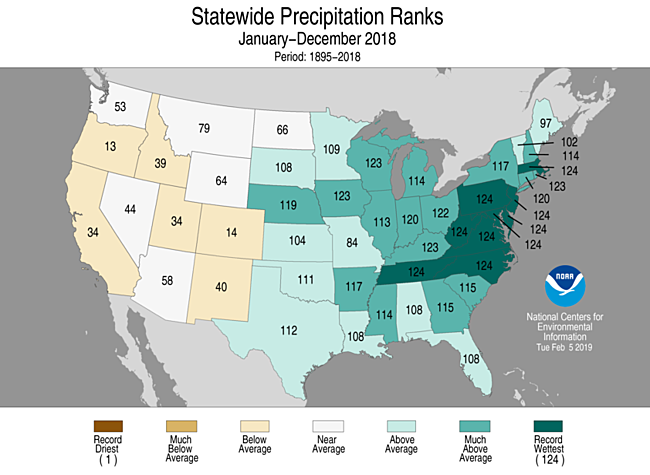 Nine eastern states – Delaware, Maryland, Massachusetts, New Jersey, North Carolina, Pennsylvania, Tennessee, Virginia and West Virginia – experienced their wettest year on record. West Virginia’s statewide total of 65.13 inches broke its previous record (59.42 inches in 2003) by nearly six inches. North Carolina’s annual total of 68.36 inches was more than five inches greater than the previous state record (63.16 inches in 2003). Several locations in coastal North Carolina and the Southern Appalachians observed annual totals of 100 inches or more of precipitation for the first time in their observational history. Rainfall totals at several stations in eastern states appear to have set all-time single-station annual precipitation records for their states, according to preliminary data. These events will be investigated and confirmed in coming weeks. Much of the West and Pacific Northwest experienced a dry year. Oregon’s annual precipitation of 25.40 inches was nearly seven inches below average. Drought was persistent across much of the American Southwest. A large area of extreme to exceptional drought dominated the Southern Plains early in the year, before improving during the summer, when drought intensified across Oregon and adjacent parts of the Pacific Northwest and Great Basin. Large parts of Colorado, New Mexico, Arizona, Utah and Oregon experienced drought throughout the vast majority of the year. Smaller parts of northern North Dakota, West Texas and Southern California did as well. According to the U.S. Drought Monitor, drought coverage peaked at 39.6% of the contiguous United States in early February 2018. This coverage was largely attributable to intense drought stretching from the Southern Plains across the southern Rockies and Four Corners regions. A secondary peak of 35.7% in early August was driven by continued drought in the Four Corners region and a new center of drought conditions in Oregon and parts of the adjacent Northwest. The winter 2017/18 season left abundant snowpack in the Northern Rockies and Northern Cascades. However, the Southern Rockies, Southern Cascades and Great Basin ranges observed significantly below average snowpack by winter’s end, contributing to spring and summer drought conditions in adjacent regions. 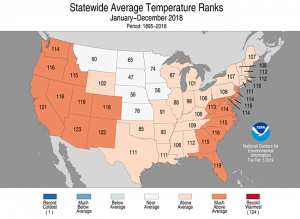 Much of the contiguous U.S. was warmer than average, particularly west of the Rockies and across the coastal Southeast, which were characterized by much-above-average temperatures, within their warmest 10 percent of the record. Most of the Northern Plains and Upper Midwest experienced near-normal temperatures. Fourteen states across the U.S. had annual temperatures among the 10 highest on record. Arizona: second highest; New Mexico: third highest; and California: fourth highest. South Dakota and Nebraska, respectively, observed annual average temperatures 0.4°F and 0.1°F below their 20th century averages. Although these values are categorized as “near normal” or in the middle third of their respective histories, this marked the first year since 2014 that any state observed a temperature at least nominally cooler than its 20th century average. As has been the case for much of the 21st century, departures from average for daily minimum (overnight) temperatures were higher compared to departures from average for daily maximum (afternoon) temperatures. For the contiguous U.S., overnight temperatures were seventh highest on record, while afternoon temperatures were 26th highest. This effect was most noticeable in portions of the East, Midwest and Plains where wetter conditions prevailed. North Carolina and Virginia observed the highest average overnight temperatures of their respective records. The last four-year (2015–2018) and five-year (2014–2018) periods are the warmest four- and five-year stretches on record for the contiguous U.S. Since 1895, the contiguous U.S. has observed an average temperature increase of 1.5°F per century. Outside the contiguous U.S., Alaska’s statewide temperature of 30.4°F, which is 4.5°F warmer than its long-term (1925–2000) average, made 2018 its second warmest year on record, behind only 2016. The Alaska annual temperature is increasing at an average rate of 2.9°F per century since 1925. During a 24-hour period spanning April 14-15, 2018, a rain gauge at Waipā Garden, near Hanalei, on the Hawaiian island of Kauai, observed 49.69 inches of rainfall. This is the greatest verified amount of precipitation observed in 24 hours in the United States. The previous record of 43 inches was set at Alvin, Texas, in July 1979. 2018 marked the eighth consecutive year with eight or more billion dollar disasters, exceeding the long-term average of 6.2 per year. It was also the eighth year overall with at least 10 billion-dollar disasters; all but one of those years have occurred since 2008. 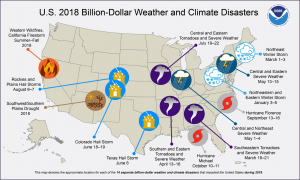 In the 39-year record, the U.S. has sustained 241 weather and climate disasters where the overall damage costs reached or exceeded $1 billion each, adjusted to 2018 dollars. The cumulative losses costs for these 241 events exceed $1.6 trillion. Two large and devastating wildfires impacted California in early November. The Camp Fire burned more than 153,000 acres in Northern California, near Chico. The fire caused at least 88 fatalities and destroyed more than 18,000 structures, with the town of Paradise being the hardest hit. This marked the most destructive and deadliest wildfire on record in California and the deadliest wildfire in the U.S. since the Cloquet Fire in 1918 killed 453 people in Minnesota. In Southern California, the Woolsey Fire destroyed more than 1,500 structures and caused at least three fatalities in and around Malibu. Hurricane Michael made landfall near Mexico Beach, Florida, on October 10th with sustained winds of 155 mph. This was the third most intense hurricane to make landfall in the contiguous U.S. based on central pressure and the fourth most intense based on wind speed. Michael was also the most intense hurricane on record to make landfall along the Florida Panhandle. The storm caused widespread devastation across the Florida Panhandle and farther inland across Georgia, the Carolinas and Virginia. There were at least 45 fatalities blamed on the storm in the U.S.
Hurricane Florence, one of the deadliest and costliest to ever impact the Carolinas, made landfall near Wrightsville Beach, NC, on September 14th and moved inland slowly, with heavy rains, storm surge and record flooding, causing at least 51 deaths and extensive flooding across much of the Carolinas and Virginia. The U.S. 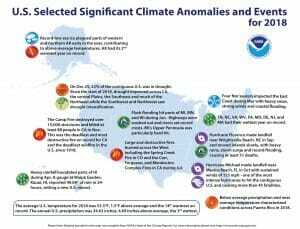 Climate Extremes Index (USCEI) for 2018, when taking into account landfalling tropical cyclones, was 66% above average and ranked as the eighth highest annual USCEI in the 109-year record. When excluding the tropical cyclone component, the USCEI remained 66% above average and ranked as the ninth highest on record. Extremes in warm minimum temperatures (fifth highest) and days with precipitation (highest) contributed to the elevated USCEI. The USCEI is an index that tracks extremes (falling in the upper or lower 10 percent of the record) in temperature, precipitation, drought and landfalling tropical cyclones across the contiguous U.S. 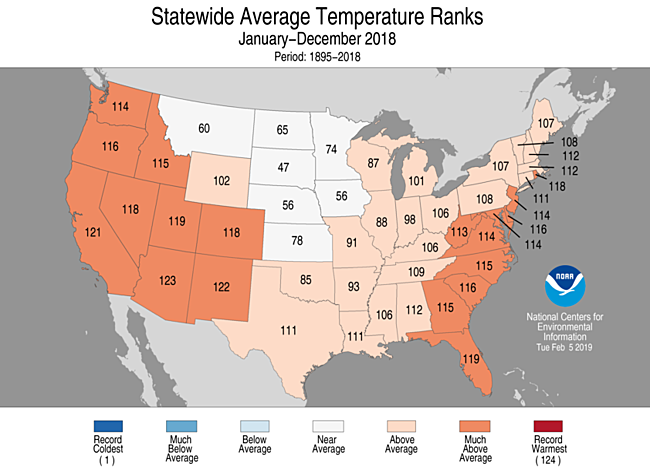 The January 2019 average temperature for the contiguous U.S. was 32.7°F, 2.6°F above average and ranked among the warmest third of the historical record. Near-normal temperatures generally prevailed in the eastern half of the country, while the West was above average for the month. Although short-lived, a cold outbreak near the end of the month gripped much of the Midwest and Northeast, where many daily cold temperature records were set. Alaska was warmer than average for January. Its statewide temperature of 7.4°F was 2.2°F above its long-term average. The contiguous U.S. precipitation total for January was 2.49 inches, 0.18 inch above average. This was the sixth consecutive month with nationally averaged precipitation categorized as above average or much above average. Large portions of the Northeast recorded much-above-average precipitation. Rhode Island and Vermont each had their eighth wettest January on record. Alaska precipitation was near normal for the month. Its statewide value of 2.48 inches was 0.25 inch less than the long-term average. According to the January 29 U.S. Drought Monitor report, 16.5 percent of the contiguous U.S. was in drought, down more than five percentage points since the end of December. Drought improved across much of the Southwest and California.